The downtown Redding Mall in Redding California was one of the oddest malls ever. 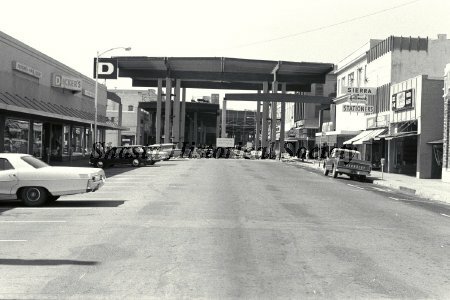 Unlike suburban malls the downtown Redding Mall was basically 6 blocks of downtown Redding covered up and air conditioned. It was started in the LATE 60'S with federal urban redevelopment funds, no one actually owned the mall itself, it was owned by the city of Redding, but the actual buildings that the Mall enclosed were all owned by different individuals. When it first opened it was a great place to go. It never had a major chain anchor store, but it had Dickers, which was a fairly upscale local department store, and it also had Payless drug which was more like a small department store. It also had a couple shoe stores, at least 3 eateries, A small toy store,a music store and an arcade, plus many other small retail establishments. The final phase of the mall was actually completed sometime in the early 80's, and it began to decline soon after that. In the early 70's a real Mall was constructed on Hilltop drive across the river. This mall, Called The Mt. Shasta Mall soon attracted all the downtown chains like Sears and Pennys. It also had a 3 screen movie theatre and a Pay n Save. Soon After it opened the downtown mall began losing tenants. In the 90's it went downhill fast. Dickers closed in 1992, Payless drug was reduced to a storefront and didn't last much longer. By 1995 you could walk the length of the mall at Christmas season and not see a single shopper, but you could hear plenty of water dripping into the buckets from the leaky roof. The city had no choice but to remove the mall, since the roof basically needed to be replaced. In 2013 the Downtown mall was removed, sort of. The roof and entrances were removed, and it was made an open air mall, though three of the enclosed wings are still intact. The Downtown Redding Mall was quite unique. A lot of cities turned there down towns into open air pedestrian malls, but as far as I know Redding is one of the only cities to convert it's downtown into an actual enclosed mall.